If there was one ideal that characterizes the Middle Ages and sums up the entire character of that long epoch in a single word, it would be harmony. Not harmony in the sense of temporal peace, for the Middle Ages were as tumultuous and violent as any age of the sons of Adam. No, we do not mean harmony in the sense of peace, but harmony in the sense of the belief that everything can and should work together. 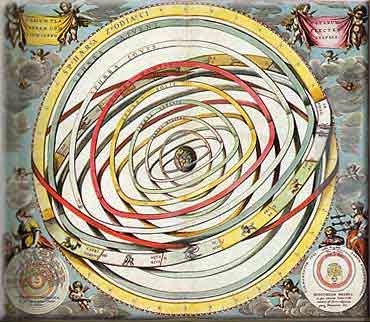 No human era tried so hard to find a place for everything within a single system as did the Middle Ages. It was an age of synthesis, when the most contradictions were only apparent, when it was believed that centrifugal forces in society could be held together, when it was assumed that the world was a single, gigantic system in which everything from the highest angel to the most fragmentary piece of prime matter had its place in God's great cosmos. No culture ever worked as diligently to reconcile the One and Many as the medievals. And what sort of divergent forces did the medievals manage to reconcile? 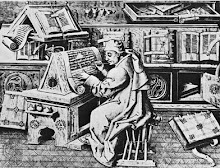 In my opinion, I believe the medieval synthesis consisted in three fundamental harmonies: Faith and Reason, Church and State, Spirit and Flesh. The medieval synthesis consisted in being able to maintain a harmonious balance between these three sets of contraries, reconciling them all in God's goodness. So long as this great balance was maintained, medieval life flourished. These three great syntheses gave rise to multiple other syntheses that flowed from them: mercy and justice, hierarchy and equality, localism and universality, collective and individual, law and custom, town and country, poverty and wealth, will and grace, private good and public good, position and humility. We could go on and on. Of course medieval society was far from perfect; but at least the medievals believed these things could all be reconciled with one another. But do you want to know why the Middle Ages broke down? It was not the rise of the nation state. It was not the Black Death. It was not the printing press or even the Protestant Revolution. What, then, caused the dissolution of the medieval world? Quite frankly, people got tired. We particularly value the medieval synthesis - but maintaining that kind of synthesis is difficult. It means a constant vigilance - avoiding extremes of defects and excess, maintaining a delicate balance between divergent forces, persisting in a careful study of problems to ensure that both poles in the harmony were maintained. And the medieval world got tired of it. People began to want Church or State, Faith or Reason, Spirit or Flesh. They revolted against the diligence required to maintain these hard-won harmonies and wanted to abdicate that effort in favor of a seemingly "easy" solution to the problems of the sons of men. Was the relationship between Church and State complicated? Then the solution was to terminate the rights of the Church and exalt the State. Tired of reconciling the place of the Flesh and Spirit, the founders of what would become Puritanism exaggerated the realm of the spirit at the expense of the flesh. The new philosophers, exhausted at the effort required to maintain the unity of Faith and Reason, cast off Faith to worship before Reason alone, while other Protestants, taking Luther's maxims to their conclusion, retreated into a citadel of pure Faith. Thus the medieval world died because men could no longer bear the effort that was required to maintain the great syntheses. And thus that world and all therein collapsed. The desire for universality - for synthesis - did not die, however. This desire is passed along through the Catholic sense and is present in anyone who truly loves the Catholic Faith. And as with the medieval world, a fidelity to the Catholic Faith in its fullness requires the same careful, diligent effort necessary to maintain harmony. And yet, I fear again we are in a time where people do not want to take the effort to maintain the harmony between contrary pressures. And what pressures do I speak of? Between a man and his office, between the Church's human and divine elements; between good and bad among our pastors, wheat and tares, truth and obedience, the spiritual and physical aspects of the Church, precision and ambiguity. 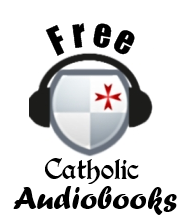 As at the end of the Middle Ages, many Catholics are tired of maintaining these delicate harmonies: to choose blind obedience at the expense of truth, or a bold stand for truth at the expense of obedience. People either confuse the man with the office by making the office into the man, or else they denigrate the man to such a degree that the office itself is held contemptible. I do not want to call anybody out by name or delve into any specific issues; I leave you with this principle to ruminate upon and see to what it is applied. The harmony of Faith is hard, but it is necessary; it holds all things together. It is nothing else than the place where the Cross comes together. Staying at this center point is really the only option if we do not want the small remnant we have to dissolve as did the medieval world. But the center must hold; the disparate ends of the spectrum must be bound together and maintained in the love and truth of God, "in whom all things hold together" (Col. 1:17). Anything less is a surrender to despair. In traditional Catholic sacramental theology, four things are necessary to have a valid and fruitful Confession: contrition, confession, absolution, and satisfaction. Too often we tend to minimize the importance of contrition, taking it to simply mean a momentary sorrow or regret. It certainly is a kind of regret, but not merely momentary, for contrition also necessitates the firm desire not to commit that particular sin again. Of course, though through human weakness our resolutions often fail us, they are still essential. An act of contrition for a particular sin requires the sincere desire to avoid committing that sin in the future. This means obviously that true sorrow for sin is incompatible with the intentional to continue committing it. One cannot simultaneously repent of sin and receive absolution while lacking any will to cease committing the offense. One cannot be absolved from a state of sin while continuing to persist in that sinful state. "When anyone has really given up his sins, he must not be content simply with bewailing them. He must also give up, leave far behind, and fly from anything which is capable of leading him in the direction of them again. In other words, my dear brethren, we must be ready to suffer anything rather than fall back into those sins which we have just confessed. People should be able to see a complete change in us; otherwise we have not merited Absolution, and it could even be possible that we have indeed committed sacrilege. Alas, that there are few in whom this change is apparent after having received Absolution! Dear God, what sacrileges are committed! If in every thirty Absolutions there were but one genuine case, how soon would the world be converted! I will not offer any further commentary upon the point, but those with ears to hear can easily see its relevance to our contemporary situation. When we launched the Unam Sanctam Catholicam website back in 2012, we originally featured a little store to sell our self-published books and other merchandise. Last month, I revamped the USC web-store and hosted it at a separate site called Cruachan Hill Press. Cruachan Hill is the name I self-published my earliest books under; I have retained the name for all subsequent works. We now have 8 books published under the Cruachan Hill name, along with 1 eBook and the always popular "Free Constantinople" T-shirt. We are kicking off the new Cruachan Hill web store by offering a series of new books. First, the Rending of Christendom Primary Document Catholic Study Guide and Answer Key. These books are designed for home schoolers studying the history of the Protestant Revolt who wish to use primary sources. From ancient Greece until the early 20th century, the study of history consisted in reading primary sources: documents written first-hand by persons involved in historical events. This reliance on primary sources was abandoned at the dawn of the 20th century by educational ‘reformers’ who pushed learning by textbook instead - with the result that most students now have no contact with the great documents of the past. 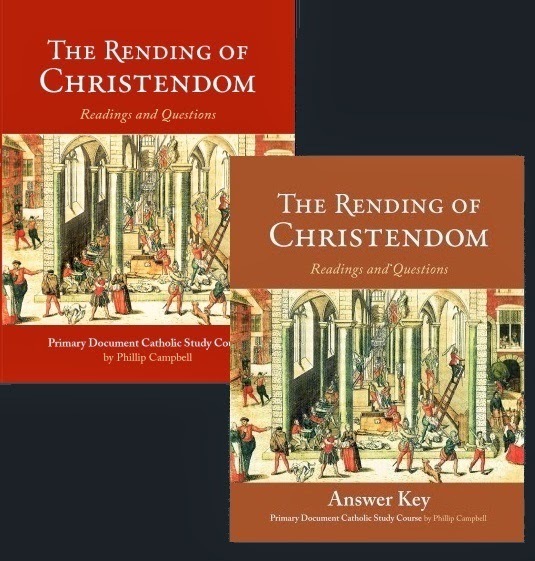 Featuring biographies, theological treatises, papal bulls and polemics from the towering figures of the 16th and 17th centuries, The Rending of Christendom sourcebook puts students in direct contact with the past by immersing them in the controversies of the period to learn its history first hand from those who were there. Catholic writings such as those Bellarmine, Borromeo, and the martyrdom of Thomas More, but also Protestant sources like Luther's 95 Theses and excerpts from the ecclesiastical ordinances of Calvin come together to give students a firsthand look at the religious landscape of the tumultuous period. The book was originally designed to supplement one of my courses I teach through Homeschool Connections, but it can stand alone and includes a recommended reading schedule for semester long course to help parents pace the course accordingly. And - if you are not the sort of parent that likes grading essays, there is an answer key (sold separately) to help you along with this. Click here for a review of the Rending of Christendom sourcebook from Mary Ellen Barrett's website. Contains readings and study questions intended for ages 14–18, 110 pages, paperback. For more information, please visit the Cruachan Hill webstore here. Our second book is War Against the Papacy by author James Larson. James Larson is one of the best traditional Catholic authors out there. Many of you may have visited his website, War Against Being, where his voluminous articles advocate a return to God using the golden wisdom of St. Thomas Aquinas. I have always appreciated Mr. Larson's essays; not your typical traditionalist, Mr. Larson does not harp on Vatican II or the 1960's as the source of our troubles but takes us way back to the 14th century, showing how our troubles all began when Catholics started to abandon Thomistic metaphysics. If you have never frequented Mr. Larson's site, I strongly recommend it. "Thou art Peter, and upon this rock I will build my Church" (Matt. 16:18). It was to St. Peter that our Lord entrusted the Keys of the Kingdom and vowed that his faith would never fail. 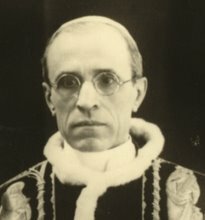 For centuries the Petrine office has been the bulwark of truth against heresies and ideologies which threaten the integrity of the Church's faith. 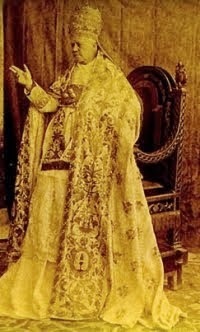 In War Against the Papacy, James Larson explains why the apparent auto-demolition of the papacy under the post-conciliar popes has not changed this fundamental reality - and why attacks against the papacy, even in the name of tradition, betray a lack of trust in Christ's promise to St. Peter. Larson presents a much needed balance in contemporary discussions of the papacy. 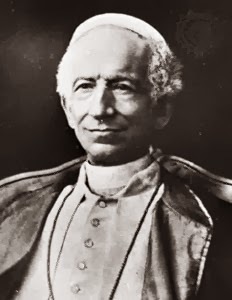 While not denying the troubling and often scandalous actions of the modern popes, he nevertheless argues convincingly that no pope has lost the faith, and why full and formal union with Rome remains a Catholic's only option. Liberal errors about a new ecclesiology in the spirit of Vatican II are refuted, but Larson is equally harsh with Sedevacantists, as well as the arguments put forward by certain traditionalists, whom Larson critiques from a traditionalist standpoint. 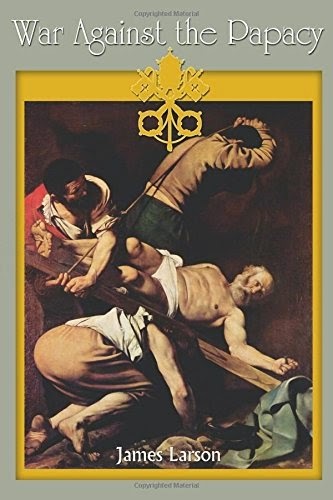 Those looking for balance in a traditionalist approach to the papacy will appreciate Larson's studious, patient, and deeply spiritual examination of the papal office. War Against the Papacy is 160 pages, paperback, $16.49 + shipping. Please click here to purchase War Against the Papacy from the Cruachan Hill product page. The Mercy of God cannot be praised, worshiped, honored or exaggerated too much. As children of wrath, inheritors of that first sin of Adam we are hoping in the Lords mercy to avoid the just punishments which we all have merited through our daily sins and negligence. But, perhaps you, dear reader cringe at the mention of the Lords mercy. The Fear of the Lord, one of the gifts of the Holy Ghost, the beginning of wisdom, and a great gift to restrain vice and sin today seems to be despised by many, and if they do grant the idea of it they are quick to dismiss any ideas of a wrathful God (which one would get even from an elementary reading of Scripture). In fact to them fearing God is the exact opposite of what we should do, and it is certainly nothing we should ever preach or teach, as that might turn people away they say. People might feel that they are being condemned, and not realize how merciful God is. I hope no one actually believes they are doing Gods work when they present God to the world as some sort of cosmic muffin man who does not even get the respect you might give to an officer when getting a speeding ticket. We spend a lot of time discussing what the enemies are of Tradition, but these attitudes come from the enemies of Contrition. Would you agree that it is too common that many of our brethren forget that our Lord cares for how he is approached? Isn't that the whole root of the problem with giving adulterers holy communion? These people may very well be sorry for their situations, but they are not broken hearted enough, not contrite enough to stop breaking the 6th commandment and remove themselves from occasions of sin. “A Christian in mortal sin may be saved without confession or absolution, but he cannot be saved without contrition.” Father O’Keefe from "Contrition"
Without contrition, without sorrow for our sins, without detesting our sins and turning away from them, without amendment of life we cannot be forgiven. It cannot be any other way. However, once we have turned our back on sin, once we have sorrow for them, once we have received absolution and have resolved to make amends to the extent of our power for evil done, we can and should hope in obtaining pardon, satisfaction, and that our fall was a means of obtaining greater grace. To not hope and have confidence in the mercy of God when we have done what he has asked of us, that is repent of our sins, is to insult Him. 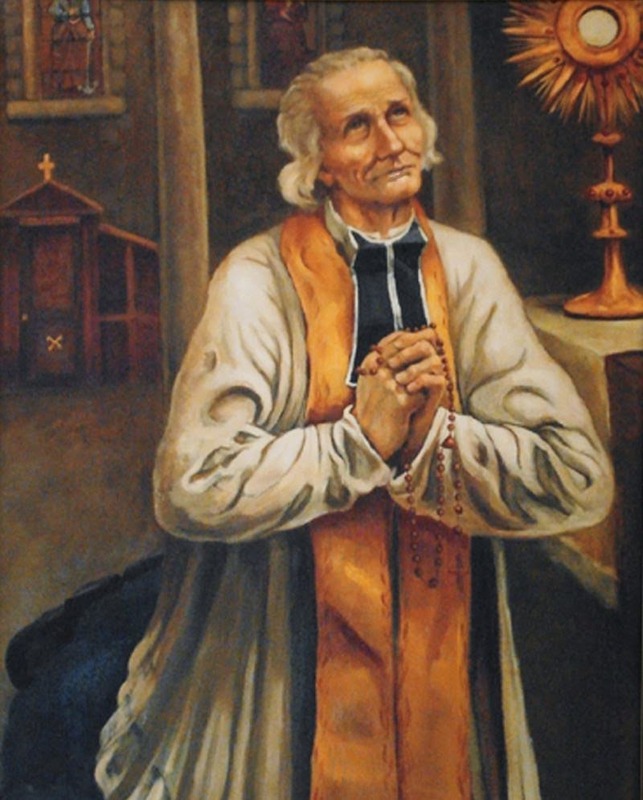 “Of true contrition and humbling of the heart, arises hope of forgiveness; the troubled conscience is reconciled; the grace which was lost, is recovered; man is preserved from the wrath to come; and God and the penitent soul meet together with a holy kiss. You think such a thing is obvious? I assure you it is not. How do I know? Because God has to keep sending us reminders of these fact through his servants, confirmed by miracles, and spread by ecclesiastical mandate. We all know that we fail to trust our Lord when we prefer our own will to His when we disobey the commandments, when we think we can find some shortcut to happiness other than walking in His ways. So, let us approach our Lord with a broken and contrite heart this Divine Mercy Sunday, and trust that God will not only pardon us, but renew our baptismal garments completely pure in that blood which he shed for us on Calvary. USC Videos: "Spirit of Vatican II Song"
Winter is past and spring is here, and with the coming of spring, let us celebrate the "New Springtime" we now enjoys thanks to the Second Vatican Council, of which 2015 marks the 50th year of its closing. In honor of the fruits of the New Springtime, I have composed a little song about the Spirit of Vatican II. I could have spent some more time polishing up the recording and singing, but it was pretty much just something I whipped out and recorded on Audacity quickly while it was in my head. Therefore, I present to you, the "Spirit of Vatican II Song", and original by Unam Sanctam Catholicam. Reactions may be mixed. Some of you may react with humor and find it hilarious. Others of you may be profoundly saddened, as much of this is no laughing matter. I count it a success if your reaction is a little of both. Happy Easter everybody! I am going to deviate from my usual routine here, in that this post is not directed at my usual readership. Rather, this article is for those of who have stumbled upon this blog accidentally: you who are sitting around this Easter with anxious hearts wondering whether you should become a Christian - or, if you already are a Christian, why you should hang on to your tottering faith. Yes, tottering faith. There are many obstacles to faith in today's world. Modern reductive science that has conditioned us to think that to understand a thing is simply to explain what it is made out of; the world is full of unspeakable evils at home and abroad, all of which challenge our confidence in an all-good God; there are the temptations of the world - pleasure, wealth, and the good opinion of men - all of which make a Christian life seem fraught with difficulty; finally, there is the scandal frequently offered by those who bear the name of Christ, who fall far short of Christ's call and serve as painful reminders of the sinfulness of us all. But an obstacle is not an impossibility. "Nothing shall be impossible with God" (Luke 1:37). God can overcome all, even death. Even your faltering faith. Ask Him. Ask Him for the gift of faith. And then be humble enough to receive it when it was given, knowing that it is often given in seed form - just a very small measure, which must be nourished and protected before it can grow up into a mighty tree. Why do we need God? We all fall short, my friend. All of us, despite our best intentions, have messed up. We might not all have killed someone; we might not all have committed adultery, but we have all really fouled things up. No matter what we will, we tend to choose selfishly. That's part of our nature, see. The world has told us that if we just tweak a little here, offer some more programs there, that we can build a material utopia. Well, even when the will and the means are there, human nature tends towards selfishness. It's just the way it is. Not that our nature is bad. It is from God. People are good. But not perfect. We are flawed. Christians call this original sin - the fact that, while we are basically oriented to the good, we are unable to carry it out because there is also a streak of selfishness within all of us. Our whole race is fallen. This is why attempts to fall back on human ingenuity and materialist ideologies to build a better world are doomed to fail. But God did not leave us in this darkness. When the time was right, He sent His only Son to take flesh and become a man. Jesus Christ took on human nature in its fullness. He felt the sweat of a hard day's work, endured the drudgery of human life, saw the world in all its frailty. But He did not succumb to its evil; though a man like us, He never committed or experienced sin, because He was also fully divine. Coming from God He was fully God; in becoming man He was fully man. Both God and Man - a Godman, and as such, the only one capable of reconciling man and God. He came to earth in obscurity, lived a perfect life, and then suffered the humiliating death of crucifixion, though He was innocent. 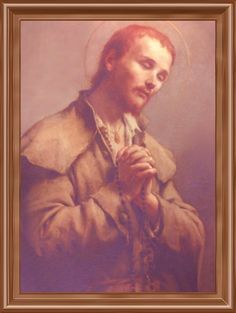 In giving Himself to the very last, He showed Himself utterly selfless and thus undid the selfishness of mankind; because He was divine, the love with which He carried out this act of self-sacrifice was so eminently pleasing to God that it wiped away the debt of sin that separated man from God. Just as God and Man come together in the Person of Christ, so God and Man are brought into harmony by the death of Christ. And because that death was so perfect, that love so fulsome, that sacrifice so perfect, death could not keep Him chained. Yes, He rose from the dead, for "love is stronger than death" (Song of Solomon 8:6). This Resurrection was a vindication - a vindication of His teaching, but also of His identity. He manifest Himself to His disciples, who bore witness that Christ was truly risen from the dead. And how does this effect you, dear friend? You see, Christ rose not just for Himself but on behalf of the whole human race. In Him, God has elevated and ennobled human nature. His death merited glory for Himself, but grace for all. He rose to glory, yes, but He makes possible your rise to glory as well. His Resurrection makes possible newness of life for you through His grace. Freedom from your sins. Freedom from your past. Freedom from whatever characterization you or others have created for yourself. Free from your passions which enslave you. Free to live as a son of God. Yes, this is all for you. He died for all mankind, but He also died for you individually - because He created you, because He loves you. Yes, God loves you. I know its cliche, but its true. But don't get too cozy with that. The idea that the God of the Universe loves you is no cause for laziness or sloth; if He loves, He expects something from you, just we all do of those whom we love. "Doesn't God love me right where I am? Why does He demand I change?" Oh yes, God loves you right where you are - but He loves you too much to leave you in that condition. What holds you back? Yes, there will always be objections, questions, uncertainties. Faith is a knowing but its also a kind of darkness. Faith does not depend on a mass of probabilities or on whether or not you have every detail worked out. 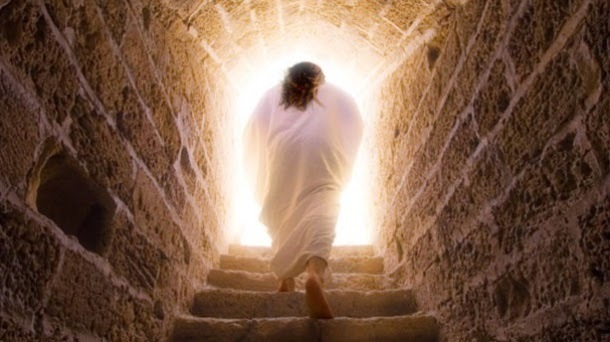 Faith comes down to this: Do you or do you not believe that Jesus Christ rose from the dead? If He did, then He is who He says He is and everything else follows. If He did not, the whole Christian faith is in vain. Yes, vain. What is your answer to the question? Did He rise from the dead? And if so - if you know down in your heart that it is true, then rejoice! You have the gift of faith, the seed of eternal life. Do not let it die. Nourish it. Nourish it in the truth. When our Lord rose, He did not leave us orphans, but sent the Holy Spirit among the Church that He founded, thus promising to lead it into all truth, so that though He is no longer on the earth according to the flesh, the Spirit of Christ can forever lead the brethren of Christ in the true Church of Christ - and this is that Church of which Peter was given the keys and made head. Yes, there will be scandal. Yes, there will be embarrassment due to human error, arrogance and sin. But ultimately it is irrelevant to your own faith. Did Jesus rise or didn't He? He rose in power; that is what this day commemorates. And if you hold close to Him, you have power too. Power to remake the world according to God's law, starting with yourself, then the Church, then the world. It doesn't matter what they do; you keep doing what you know you need to do. If the Church needs holiness, you be holy. If the world needs compassion, you be compassionate. If you do not see Christians devoted to prayer, you be devoted to prayer. The kingdom is within you and it starts with you. You have questions? So did I. But there are answers. Many, many people have walked this path before you and there is no difficulty that has not been considered and resolved. Believe the Gospel. Repent of your sins and resolve by the help of God's grace to put them away forever. Live in the freedom of the children of God. Drink the pure milk of Christ from the Church which Christ endowed with His Spirit. Frequent the sacraments. Pray intensively and make the acquaintance of other prayerful people. Honor the Church. Love God above all, as He has loved you. Make no compromise with the world. Do these things and you will experience the power of Christ's Resurrection, and the joy and freedom you possess in Christ now is but a foretaste of the eternal reward your faith will bring you in Christ, who brings all things to fulfillment. And if you do not yet have faith, then pray for it. God will grant it if you are sincere in following Him. That's really all it takes is an assent of mind and will to follow God and put Him above all. He will bring it to completion. Amen and amen! He is Risen indeed! Foot Washing: What's the big deal? Pope Francis has again made headlines by announcing he will spend Holy Thursday washing the feet of inmates at the Rebiba prison in Rome. This is the third time the Holy Father has chosen to perform the foot washing ceremony in such facilities, visiting the Casal del Marmo prison in 2013 and the Don Gnocchi center for the elderly and disabled in 2014. Saying the Holy Thursday Mass in the prison in 2013 was one of the first gestures of Francis' pontificate, which earned him the respect of many while provoking apprehension among traditional Catholics. This misgiving among traditionalists provoked (and continues to provoke) ire among those who "don't see what the problem is" and can't understand why this is such a "big deal." I would say this is one issue where the traditionalist objection is totally misunderstood - willfully, I believe. "Don't like it when Peter goes around with tax collectors and sinners, huh?" "Yeah, Jesus was offensive to the Pharisees, too." These are the sorts of shallow rebuttals our criticisms have been met with, as if there is really nothing deeper to traditionalist objections beyond the stupid old "tax collectors and sinners" trope. So - even though I know they will not listen - let me once and for all clarify what the "big deal" is about the pontiff spending Holy Thursday washing the feet of inmates. First off, lets clear the air about one thing: there is no problem with the pope celebrating a Mass at a prison or other such facility. Benedict XVI celebrated a Mass at Casal del Marmo prison during Lent of 2007 - the same location Francis used in 2013. The issue is not the location of the Mass, or that the pope wants to celebrate with prisoners, elderly, indigent, whatever. Not an issue. Benedict, however, did not celebrate this Mass on Holy Thursday, and that is a big difference. This brings me to my first objection: The traditional location of the Holy Thursday evening Mass is St. John Lateran, the pope's cathedral. 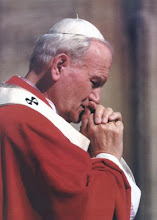 But John Paul II was had performed the rite in St. Peter's Basilica, which made the Holy Thursday Mass much more available to the faithful. St. Peter's Basilica (according to its website) is capable of seating 15,000 people; if Mass is held in the square, it can accommodate 80,000. Whatever one may want to say about Masses of that magnitude, it cannot be denied that a Mass in a basilica offers a much greater opportunity for participation of the faithful than a Mass in a small prison or nursing home. The Holy Thursday Mass, which inaugurates the sacred Triduum and which (until 1642) was a holy day of obligation is in a totally different category than, say, a daily Mass. This is why when Benedict XVI wanted to celebrate Mass in the Casal del Marmo, he did so in a daily Mass, not the Holy Thursday Mass, which as part of the sacred Triduum, is of a much more solemn and public nature than a mere daily Mass. Remember, the pope is also Bishop of the diocese of Rome. This means that for the past three years, the faithful of that diocese have been deprived of access to the celebration of one of the most sacred Masses of the year by their bishop. I admit this is not a huge issue or a monumental scandal - but it is something. Regarding the importance of this inaugural Mass of the Sacred Triduum, it is well to recall that its proper name is the "Mass of the Lord's Supper." The "theme" or focal point of this Mass has always been the double institution of the Eucharist and the priesthood by our Lord Jesus Christ at the Last Supper. This is why one of the readings from the Holy Thursday Mass has always been the institution of the Eucharist as described in 1 Cor. 11:23-32. This has been part of the readings for the day as far back as we have records. In Pope Francis' Holy Thursday celebrations, there is little emphasis on these traditional themes. For example, Francis' 2013 homily does not mention the Eucharist at all; the refrain was a very generic message of "Help one another"; Francis' 2014 homily focused entirely on the foot washing ceremony and admonished Christians to "be servants to one another." No mention of the priesthood at all, and only a passing comment on the Eucharist, which he strangely subordinates to "service"; service is the main theme of the Mass in Coena Domini, and the Eucharist is an afterthought to service. 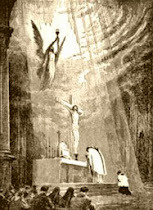 This is an inversion from the familiar formula that the Eucharist, in fact, is the source and summit of the faith. It must be remembered that though foot washing in general is a sign of service (cf. 1 Tim. 5:10), the Holy Thursday foot washing in particular is much more than that. Christ did not just wash His disciples' feet as a sign of service to mankind in general, but of the service the hierarchy renders to the clergy in particular. This is why most liturgical foot washing in the Church's history has always focused on the bishop's service to his clergy; priests, canons, deacons and subdeacons have been the recipients of foot washing; this was true of diocesan bishops as well as the pope. It is an ecclesiological ritual relating to the clergy and their superiors, not a general sign of service to mankind. It is certainly not "wrong" to wash the feet of persons not among the clergy; obviously as the parish level, a priest does not have any clergy beneath him whose feet he can wash and the washing of laymen's feet is the norm (still, in some parishes, the priest will not wash the feet of anybody willy-nilly; he will choose representatives of different parish apostolates - Knights of Columbus, the DRE, ushers, etc). As mentioned above, foot washing was a sign of general obeisance in the early church. But at a pontifical Holy Thursday Mass, we would expect a bishop or the pope especially to recognize this clerical aspect of the rite by performing the Mandatum on the clergy subject to him. This gets obscured when the focus of the rite is reduced to mere "service" without reference to the clergy. An interesting side note - it was always understood that the Lord's command to serve, while understood primarily in terms of the clergy, also had a broader significance. For this reason, beginning in the Carolingian era, there used to be two foot washing ceremonies, one for the poor, one for the clergy. This was practiced in monasteries as well as in the papal liturgies of Rome. The Mandatum of the poor was eventually discontinued, however, and only the Mandatum of the clergy remained. This illustrates the point that the "service to the poor" aspect of the Holy Thursday Mandatum was always secondary to the clerical aspect. 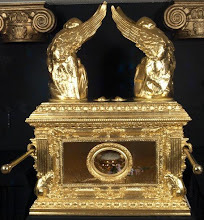 Incidentally, for a great summary of the history of the Holy Thursday foot washing ceremony, I recommend my new article "Mandatum: Liturgical History" on the Unam Sanctam Catholicam sister site. 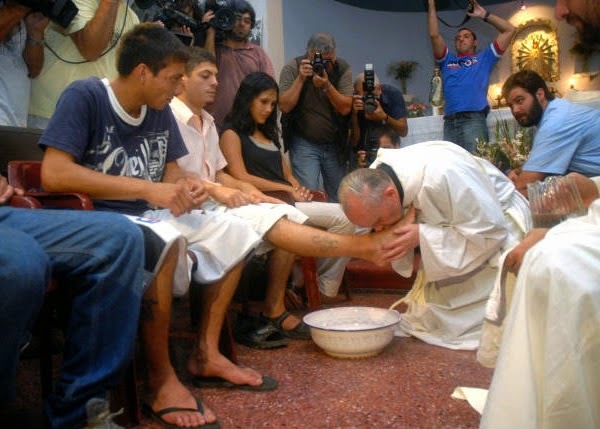 If the Holy Thursday foot washing is supposed to signify the service of the hierarchy to the Church - and to the clergy in particular - then we can easily understand why it is totally inappropriate that non-Christians should be the recipients of the ceremony. In what fantasy land can a Muslim or atheist in any way represent the Church? Finally, of course, we all know that the rubrics for Holy Thursday say the recipient of the foot washing must be a vir (Lat. "man"). In 2013, the decision of the Holy Father to wash the feet of women prompted some apologists to simply shrug and say, "Well, the Holy Father is the supreme interpreter of the Church's liturgical law and canon law. He can change it how he sees fit." That's true to an extent. But it seems lost on many that to say one has an authority to change a law is not the same thing as suggesting he can simply break the law. We all understand this. If the Holy Father does not like the current legislation, he has the power to change it. He can promulgate new rubrics or new norms if he so chooses. But for law to be law, this is accomplished by an act of law; i.e., the lawgiver changing the law by an legitimate exercise of his legislative power. The law is not changed by the lawgiver simply breaking the law. Suppose the speed limit in your town was 30 mph. Suppose your small town Mayor decided he did not like that speed limit. Suppose, on the premise that he was the "supreme authority" in your small town, he just decided to start breaking the speed limit with impunity. How would you react? You would be indignant! You would say, "If the Mayor doesn't like the speed limit, then change the law, but for heaven's sake, don't just break it!" Since the rubrics for Holy Thursday have not changed, the fact remains that Pope Francis is simply violating the rubrics. You may say the law should change. You may applaud his inclusiveness. You may affirm that he has the power to change the law. But you cannot deny that he is breaking the law every time he washes the foot of a female on Holy Thursday. There's no other way to explain it. Let us also remember that the conservative apologists who are now saying that the pope can do whatever he wants are the very same who, under John Paul II and Benedict XVI, loudly insisted that the letter of the law must be observed when it came to liberal priests washing women's feet. It is not because I or anyone else has a "problem" with the pope fraternizing with the poor, or prisoners, or whatever. It is not because we think women are inferior or any nonsense like that. The substance of the traditionalist critique of Pope Francis' venues for Holy Thursday is that this is a violation of liturgical law and hence an abuse of power; that it obscures the ecclesiological symbolism of the Mandatum rite and constitutes a detraction from the Eucharistic and clerical focus of the Mass of the Lord's Supper; and that it deprives the Catholics of the Diocese of Rome from the ability to publicly celebrate the beginning of the Triduum with their bishop, thus depriving them of special graces. You may read all this and shrug and say, "Eh. You're nitpicking." Maybe you think that. Maybe you are right. God knows. But it is definitely not a matter of traditional Catholics somehow objecting to the poor, or women, or prisoners receiving papal attention. You may think the objections are not worthy of consideration; but at least acknowledge that there are legitimate objections that go far beyond the tired old "tax collectors and sinners" mantra. It was never about that anyway.